Preferred Habitat: Wet fields, marshes, mudflats. 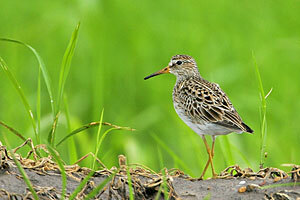 Notes: Pectoral Sandpipers are grouped among the "grasspipers," or sandpipers which prefer marshes and prairies. Other "grasspipers" include Upland, Bairds, and Buff-breasted. In coloring, Pectoral Sandpipers resemble Least Sandpipers, but Pectoral Sandpipers are about twice as big and more elongated in shape. Males are larger than females. Both sexes have dark, streaky breasts and white bellies.